Check out my feed back. Watch for my frequent auctions for hard to find quality monster mags and movie posters. Very fine / Near mint. 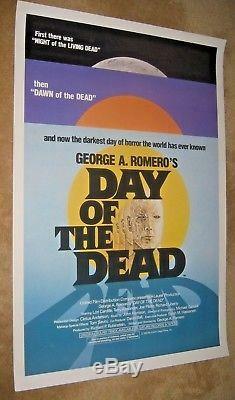 The item "DAY OF THE DEAD'85 Rolled original one sheet! GEORGE ROMERO / ZOMBIES" is in sale since Wednesday, November 1, 2017. This item is in the category "Entertainment Memorabilia\Movie Memorabilia\Posters\Originals-International\1980-89". The seller is "spyder75golf" and is located in Massapequa, New York.